Last year I was very happy to provide an article for the lovely, eye-candy-full fiber magazine ‘Entangled’. This article was rather fun to write, probably more about my warped sense of humour than anything yarn related, but, maybe you will like it anyway! Now, since Entangled has stopped publishing (sob), I think its probably ok for me to share the article with you all here too. 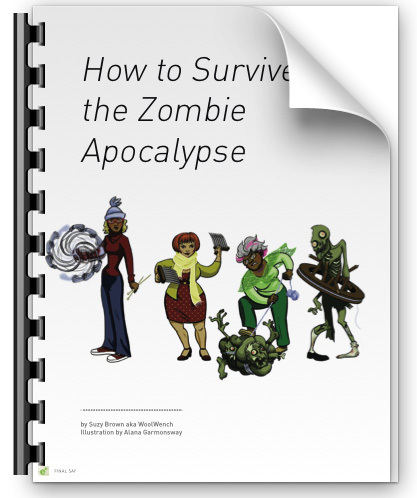 I’d love to hear any tips you may have for surviving the zombie apocalypse as well, I am sure there is something I missed from our fiberistas arsenal! I might need another spinning wheel or even two. Otherwise I could be IN DANGER. Great article. LOL, This is soooo funny and true. I especcialy imagine myself defending my loved ones swinging my woolcombs. They could do as deadly weapens indeed! So funny! I loved this! And it’s always nice to know that I’m not alone in the fact that I have fiber and supplies all over the house and garage…. LOL. I Know! all our Stuff is lifesaving in many ways!!!! This is the funniest rhing I have ever read. EVER.